The words "public speaking" cause fear and anxiety in the minds of otherwise competent and confident people. 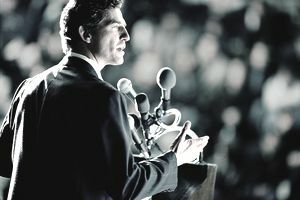 Does the thought of speaking in front of a group evoke fear, make you sweat, and get your heart pounding? It's likely you have glossophobia - the fear of public speaking. Glossophobia is one of the most common of fears. There are many ways to increase business exposure so why bother to overcome your speaking jitters? Stepping up to the podium not only positions you as an expert in your area of business but it also provides effortless referrals and improved sales opportunities. Presenting a non-sales informative speech warms up your target market and builds trust. Unlike endless cold calls, the people you present to and follow up with are more receptive to listening to your offering of products and services. Overcome your fear of public speaking and boost your business with these seven tips. If you're new to the world of public speaking, start small. Find a few friends and family to practice on. Begin by speaking to smaller groups and build up from there. The size of the audience makes no difference. If you know your topic, you're pre-speaking fear will quickly evaporate. Nothing helps ease the fear of public speaking more than knowing your material. The ability to connect with your audience comes from having the confidence you won't get lost during your delivery. Rehearse several times before the big talk. Time your presentation and always have back up material in case time is left over. Mastering the art of public speaking comes not from memorizing word for word your entire speech. The real pros know their material by remembering key points and prompts on sub topics and examples to cover. The majority of business presentations and speeches are boring monologues filled with endless PowerPoint slides and bullet points. Trash the PowerPoint presentation and make your material the focal point of the talk. If you do use PowerPoint, take the approach of using visuals that quickly convey your message. The most fearful moment of any presentation is the one minute before your stage entrance. Use the tactic of elite athletes by visualizing a positive outcome and using deep belly breathing to reduce stress and build confidence. Prior to your public speaking on stage introduce yourself to a few members of the audience in the front row. During your talk look these people in the eye to ease your nerves and connect with your audience. Creating a monologue presentation puts the entire task of informing and entertaining the audience on you. Make your talk a two-way interaction with questions and participation to reduce boredom and speak with ease. Having the group involved also gives you time to reorganize your thoughts if things are going off track. Make public speaking part of your marketing plan and boost your business success. Your fear will evaporate over time and you will wonder why you didn't start sooner.